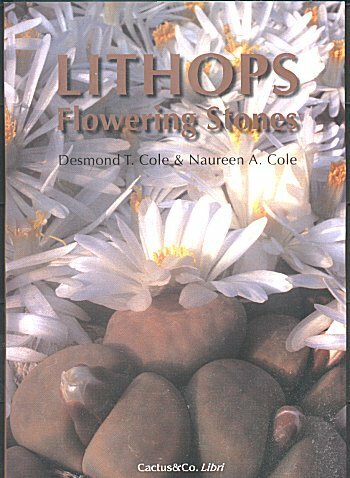 When first published in 1988 Lithops Flowering Stones was widely recognized as a uniquely fine achievement. It soon sold out, making this newly augmented and relatively inexpensive version all the more welcome. Note the joint authorship: the indispensable Naureen Cole finally appears on the title page along with her more public husband. Seventeen years is a long time in a botanical life, but there's been relatively little to update; just three previously unknown species have come to light. Two are included here, reports of a fourth and fifth being as vague as the patterns of the third, an enigmatic little Namibian which emerged too late for inclusion in this book. Otherwise the perfectly polished text stands as it was, with small tweaks here and there. I only wish that the book had been expanded to include Cole's old essays, published in journals now difficult to obtain. Many of them cleared up mysteries left by G.C.Nel, the chaotically perceptive author of the first full-scale work on Lithops. The essays are reflected but not necessarily recapitulated in the texts of 1988 and 2005. Physically, the new edition is a big improvement on its predecessor. It has grown twice as heavy, mostly via the fascinating addition of habitat photographs for every species and all but two of the subspecies. To an unusual extent, lithops are an expression of particular niches -- anyone who doubts that should check Desmond Cole's images of L.comptonii var. weberi pocketed in limestone, L.hermetica hiding on its rough and lonely gray eminence, the puckered lumps of L.hookeri var. elephina amongst Henry Mooreish sandstone, or the dark and implausibly shiny ironstone which cradles the equally shiny L.hookeri var. subfenestrata. An understanding of the species and their relationships is enhanced by the geographical perspective offered here. Close-up portraits were taken in the Coles's lithoparium near Johannesburg. The plants were so carefully anchored in their native soil and stone and so well-tended that, given the absence of visible pot-rims, they could have been photographed in the wild, had the wild been well-watered a month or two earlier. I compared the portraits in my 1988 copy with their counterparts of 2005 (most are repeats); 2005 wins in every case, colors are truer and the sense of dimensionality is greater. (It may be that the pigments in my old sun-cooked copy have faded slightly with age.) Some of the individuals newly seen are of impossible beauty -- the L.julii subsp. fulleri var. rouxii on p.197 (upper right) has a pattern of smoke rings that will touch anyone remotely susceptible to the spell of this genus. The lovely-dust jacket gives us a nosegay of L.karasmontana on the front and a terrific nougat-swirled form of L.gracilidelineata on the back. The maps are equally excellent, presenting as clear a picture of distribution patterns as discretion and scale would permit. They also renew a few puzzles from 1988, still resonant today: tell us more about that unnumbered (and evidently non-Coleoran) L.otzeniana north of Kliprand! Who found those additional L.schwantesii subsp. gebseri populations, and what do they look like? (Most of us know this taxon only from its type locality, Cole 165.) The new book has the helpful addition of a complete list of Cole numbers and their euphemized data, previously issued in pamphlet form. (A few varietal identities have shifted.) There is also an artificial key which telescopes subspecific taxa into their respective master species, thus providing a coalescent view of each. The lively drawings are the work of Gerhard Marx, the best lithops grower I know apart from Flora herself. Binding and paper are first-rate and would normally command a much higher price than that asked by Cactus and Co. Libri, which must have a secret Euromint. I'd only note that some slides were enlarged beyond their natural limits and one or two should have been cleaned better; slide- shown motes are magnified along with the instructive rubrications, those reddish tattoos sported by so many species. L.terricolor N.E.Br. after having accepted the older name, L.localis (N.E.Br.) Schwantes in their 2001 treatment of the genus (in the Springer-Hartmann Handbook on Aizoaceae). There may be good reasons for the reversion but they are not adduced; neither the 2001 text nor my 1995 paper on which it hinged is cited in the relevant essay, unchanged from its 1988 incarnation. There is, however, a new essay concerning the long-lost L.halenbergensis Tischer. It recounts recent searches for this elusive taxon and rejects the theory that the original plants were hybrid in origin, despite the fact that they neatly blended features of the two other species known from Haalenberg. (That L.[karasmontana subsp.] eberlanzii occurred with L.francisci on Haalenberg (and Kovisberg) was attested to by Wilhelm Triebner.) The presence of three species on a single small formation is a pattern unknown in the genus except for the famous triumvirate: L.verruculosa, L.villetii subsp. deboeri, and L.julii subsp. fulleri (C 230 a, b, and c, east of Gamoep). I fancy that subsp. fulleri, found as a single mateless plant, arrived as a seed on Nel's shoes when he investigated the same spot in Sept. 1946! That is a triply wild conjecture, but it does not seem that 230c represented a viable population. I also doubt that L.halenbergensis had any real viability -- if it was not a hybrid, perhaps it was a mutation of the sort that gave us the amazing yellow-flowered L.optica `Rubragold,' one of several recent cultivars. Ah yes, the cultivars! Those traffic-lit lollipops are prominently featured here. There are some dandy new ones; the white-flowered L.ruschiorum `Silver Reed' has a particular elegance, a contrast to L.ruschiorum's usual sunny-side up scheme, and the color-challenged form of L.hermetica `Green Diamond' adds a cool mossiness to the Namibian palette. It occurs to me that all the species will eventually go grassy or rubescent! The more striking point is that the greens or reds are influenced by the basic pigmentations of a species, thus the chartreuse of L.hallii var. ochracea `Soapstone' outgreens the greyish L.salicola `Malachite,' and L.meyeri `Hammeruby''s opaque sherbet-carmine is unlike the beguilingly liquid translucence of L.optica `Rubra.' Further breeding will undoubtedly intensify the parameters and possibilities. Meanwhile we have the much larger and more critical task of maintaining the pure species. The master Cole collection has now fallen into institutionalized desuetude and in a sense this book functions as its memorial. Living perpetuation of the Cole system will depend entirely on the quality of secondary distributions. Desmond Cole's illustrations of cultivated plants remind us of just how desirable and complex that perpetuation will be, while his habitat photographs, and the eloquent text, confront us with nature's glory and fragility. Available from Cactus & Co in Europe. This book like all the Cactus & Co publications is exceptional value for money.